Water Cooler King: Premium Water Cooler Installation Kit with saddle valve, fittings and water block. 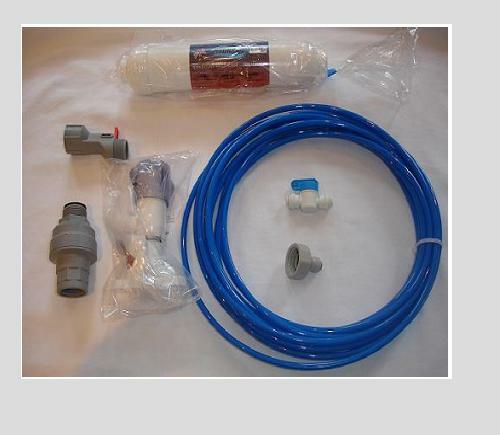 This Water cooler installation kit comes complete with everything you need to easily connect your cooler to a standard 15mm copper pipe even without an existing connection Point. Contents include Saddle Valve (clamps over existing 15mm copper pipe and connects easily, full instructions included) 3/4" BSP to 1/4" adaptor 2 meters of 1/4"pipe, 1/4" in line Isolation valve Water Block – shuts off excessive water flow in the event of major leak Carbon Filter Please ensure that any water pipe connected to is drinking water quality. The items in the photograph are illustrative only, actual items may vary in appearance but will be functionally the same.